On August 31, 2012, there will be a full moon. 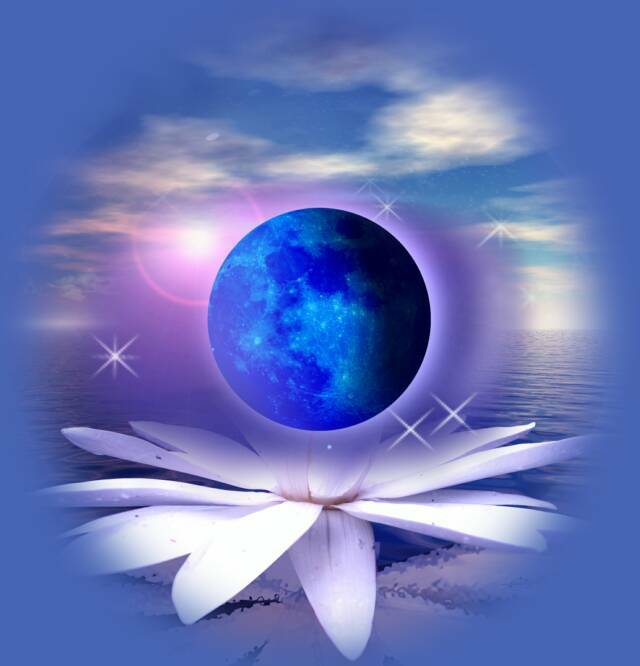 Since it is the second full moon in the calendar month, it is considered a “blue moon”. Inspired by the occasion, I decided to try and blend an aromatic oil that tapped into the essence of this rare August harvest moon. With the idea of a blue moon in mind, I started the blend with the beautiful Blue Lotus infusion as the soft floral top note. I added a wee bit of Clary Sage for the sense of dreamy euphoria it can inspire, then added the herbal notes of Coriander and Palo Santo to remind me of the heady aromas of the herbal harvest. Finally, I anchored them all with the earthy richness of Vetiver. It was tricky to find the right balance between these notes. Clary Sage can be deceptively overpowering in a blend. It doesn’t strike the nose with force, and yet it can easily take over. Although the Blue Lotus infusion is the richest Lotus in my collection, I had to tilt the ratio heavily in favor of the Lotus to balance the Clary Sage. The Coriander and Palo Santo bond in a lovely way. The coriander is spicy and herbal, which plays well to Palo Santo’s sweeter, more persistent bouquet. Together, they balance and hold the middle notes of the blend. I needed a strong base note to anchor the ethereal top notes and the fresh herbal middle notes. Vetiver pulls them together beautifully, embracing them with its deeply earthy sweetness. Lotus couples a subtle aroma with a powerful emotional and spiritual effect. It brings serenity and tranquility. Lotus puts the mind in a state of relaxed awareness, as through a veil has been lifted, allowing a deeper understanding, and a brightening of vision. It helps open the crown and third eye chakras. Clary Sage enlivens the senses and dispels illusion, restoring clarity. It’s known for it’s mental-emotional uplift and euphoria. It helps restore a “felt instinct” for our life’s true purpose. By restoring lucidity to the instincts, clary sage allows inspiration to flow. Palo Santo is grounding. It helps open, align, and connect the chakras. It is a useful aid to meditation and is used for spiritual cleansing and renewal. Coriander has a reputation as a euphoric and aphrodisiac. Combining a warm and woody serenity with peppery stimulation, the oil both calms and uplifts, making it good for worry and anxious overthinking. It imbues a feeling of security, peace, and earthly permanence. Yet it couples this with a feeling of spontaneity and passion, and seeks to achieve stability without denying joy. Vetiver relaxes an overheated, hyperactive mind and nurtures an insecure self-identity. The oil imbues us with the calm, reassuring strength of Mother Earth, and her deep sense of belonging. Whether mentally exhausted from overwork, or out of touch with our body and its needs, Vetiver sedates and yet restores us – centers and reconnects us – closing the gap between Spirit and matter. May this full moon offer you a moment of reflection and beauty. Namaste.